The portable pharmaceutical washer is composed of the box body, vertical multistage pump, pneumatic control system, electric control system and other components (See fig1, fig2). When working, open the lid of the blending bin, material barrel and other containers to be cleaned, put on the lid that is equipped with a washing rotary nozzle, and prepare the washing well. Set the cleaning procedure and time based on technical requirements, and after confirmation, wash both the inner and outer surfaces according to the setting procedure. 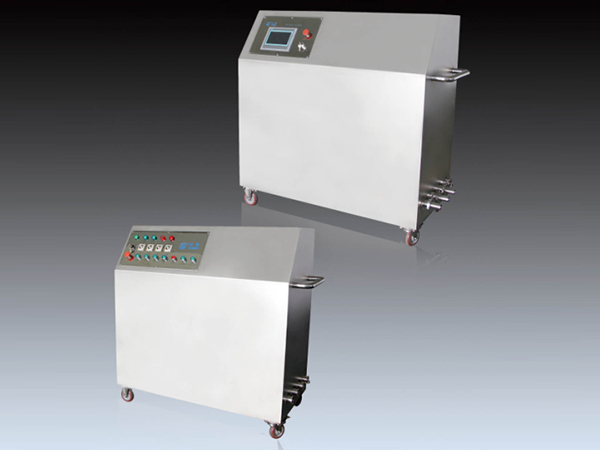 Outer surfaces can also be washed manually using a high pressure water gun.